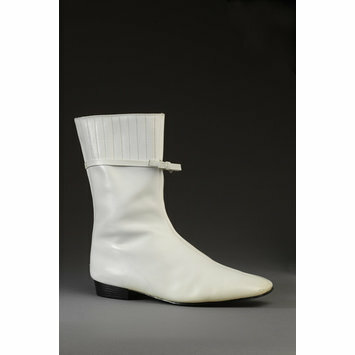 André Courrèges' minimalist designs propelled fashion forward with his 'space-age' collection of 1964. The show included precision-tailored short skirts and slim trousers, worn with boxy jackets, all designed to be worn with accompanying flat, square-toed shoes and boots, and short white gloves. This futuristic look profoundly influenced fashion in the mid-1960s, and Courrèges' ideas were widely copied for the mass market. 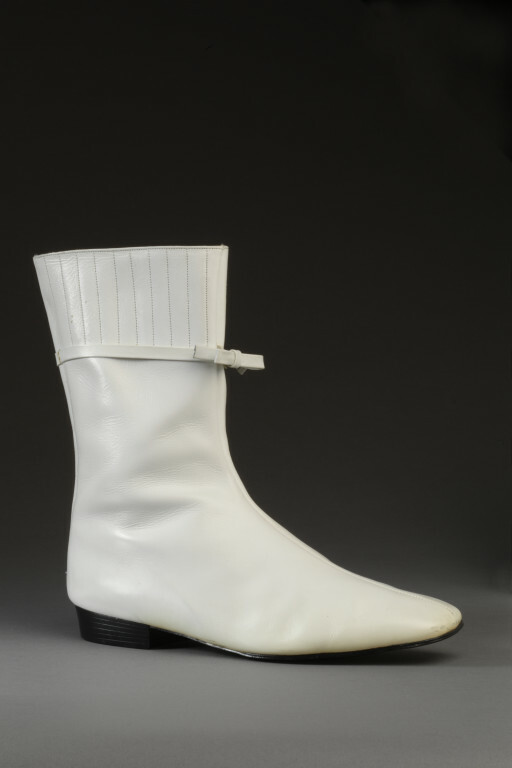 His flat, white leather boots were essential for girls emulating the 'moon-girl' image, a new version of femininity, inspired by youth, sportswear, and space travel. Pair of white leather ankle boots with pleated leather cuffs and self-bows around the top. Black plastic flat soles, and zipper down back with Velcro placket. Formed part of the Cecil Beaton collection of 1974. Donated by the designer.